Have you ever wondered how restaurants are able to deliver so many different dishes to your table in a small amount of time? Well today I’m going to share their ‘secret’. Basically apart from having lots of staff, restaurants do most of their prep ahead of time. So when the ‘heat is on’ during service they only need to put the finishing touches on each dish. The technical term is ‘mise en place’. Ever eaten at a restaurant with an exposed kitchen so you could watch the chefs at work? And ever noticed all the little containers and bottles of sauces they have at their work stations? Well you’ve seen ‘mise en place‘ in action. Mise en place is a French term that roughly translates as ‘put in place’. It’s used to describe the practice of chefs preparing food up to a point where it is ready to be used in a dish during food service. It may be as simple as washing and picking herbs into individual leaves or chopping vegetables. Or more complicated like caramelizing onions, cooking dried beans or slow cooking meats. The main benefit in a restaurant is that it makes it much quicker and easier to get food on the table after the customer has ordered. The secondary benefit is that the preparation can help to extend the shelf life of fresh produce, meaning less waste. How can this ‘secret’ help you? By taking the time when you can to do a little ‘mise en place’ preparation, we can make it much quicker and easier to get dinner on the table when we come home from work late and everyone is hungry. Happily, a little bit of preparation can actually extend the shelf life of fresh produce. Which means you have more time to use your precious veg before they go bad. 3. Makes it easy to just ‘throw something tasty together’. I’ve found that prepping ahead and pretending I’m a chef* with my ‘mise’ has an unexpected benefit… It makes it much easier to look in the fridge and actually get inspiration for what to make for dinner. There’s something about having at least some of the work done that makes the decision process much easier. Could you benefit from our little ‘secret’? 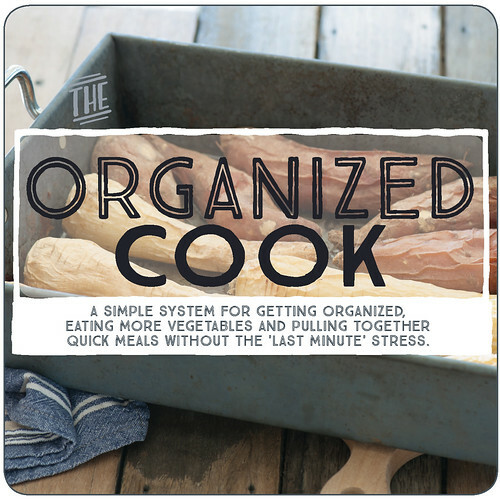 Then I invite you to join me for The Organized Cook online program. Kathleen, The Organized Cook Student. Some of my favourite meals involve some take on this quick and easy bowl of goodness. Basically we’re talking a truck load of greens, given a flavour boost with some lemon and garlic and made more substantial with some protein and almonds. For me this is comfort food, like putting on my uggies and getting a big hug. 1. Wash kale and slice crosswise into ribbons about 1cm (1.3in) thick, discarding the woody stems. Don’t worry about drying, the extra moisture helps the kale to steam. 2. Heat a large pot on a medium high heat. Add a very generous glug of olive oil, the sliced kale and garlic. Cover and cook, stirring every few minutes until the kale is tender and wilted. If it starts to burn add a splash of water. 3. Remove pot from the heat. Season kale generously with salt, pepper and a big squeeze of lemon (or more if you like it really zingy). 4. 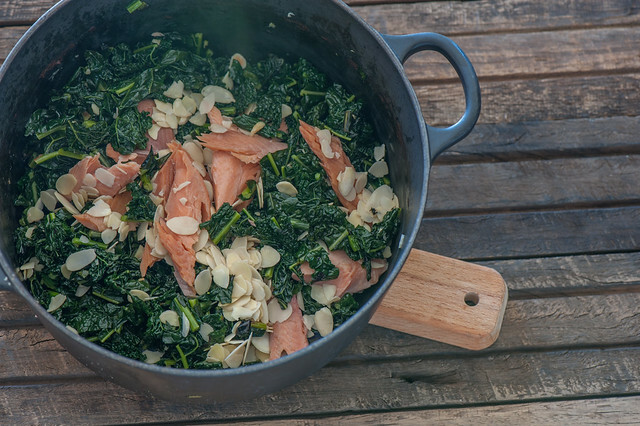 To serve, divide kale between two bowls and top with fish and almonds. vegetarian – replace fish with extra almonds, cooked chickpeas, crumbled feta or blue cheese, or poached eggs. nut-free – skip the almonds or replace with toasted bread crumbs. different greens – I love Tuscan kale here but any greens are good. Try different types of kale, collard greens, spinach or chard (silverbeet). Frozen spinach can also be used – no need to slice, just defrost and cook uncovered so you get rid of the excess moisture. different protein – anything cooked will work. Think smoked salmon, pan fried sliced chorizo or other spicy sausages, crispy bacon, shaved parmsean, canned fish (hello sardines! ), leftover cooked meat or poached or fried eggs. creamy – stir in a few tablespoons double cream with the lemon juice. extra zesty – add the zest of the lemons with the juice. carb-lovers / more substantial – toss in cooked pasta or serve the kale piled on hot buttered sourdough toast. different nuts – I really love almonds with the trout but feel free to use whatever nuts you have, it will taste better if they’re roasted but it won’t be the end of the world if you can’t be bothered! I often don’t. What a fabulous find this site is!! Having company for two weeks and was overwhelmed at the idea of having to come up with 3 meals a day and snacks. Thank you, thank you , thank you!! Enthusiastic new member of Stone Soup! 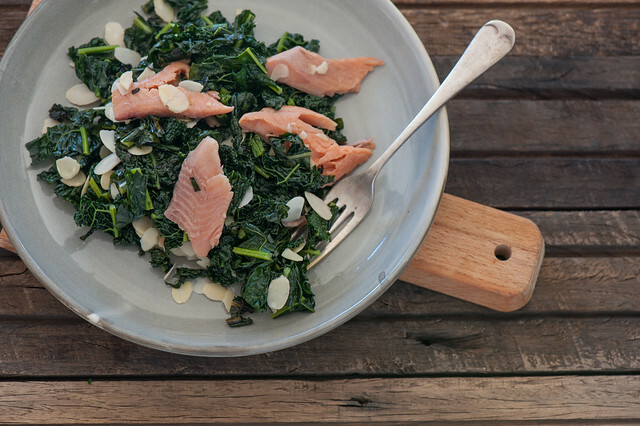 Yesterday I was exhausted (physically and emotionally) and remembered seeing this recipe which had inspired me to buy some kale and smoked salmon. My phone was broken so I wasn’t even able to pull the recipe up, but I told myself, this will be easy. Handful of pecans (all I had). Delicious!!! SO fast!!! So easy! So flavorful! You’d never know it was only 4 ingredients. I never would have gotten smoked fish if not for your suggestion. And I never would have eaten such a veggie-filled meal on a low-energy day if not for your blog. You’re really helping change my relationship to cooking.